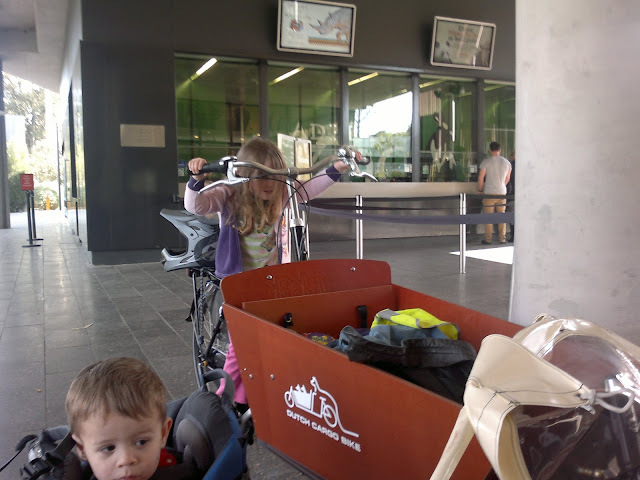 At some point, I would like to build my bakfiets-fitness to the point where I can ride with the kids to more distant places, including into the hills, and maybe even do some overnight trips. 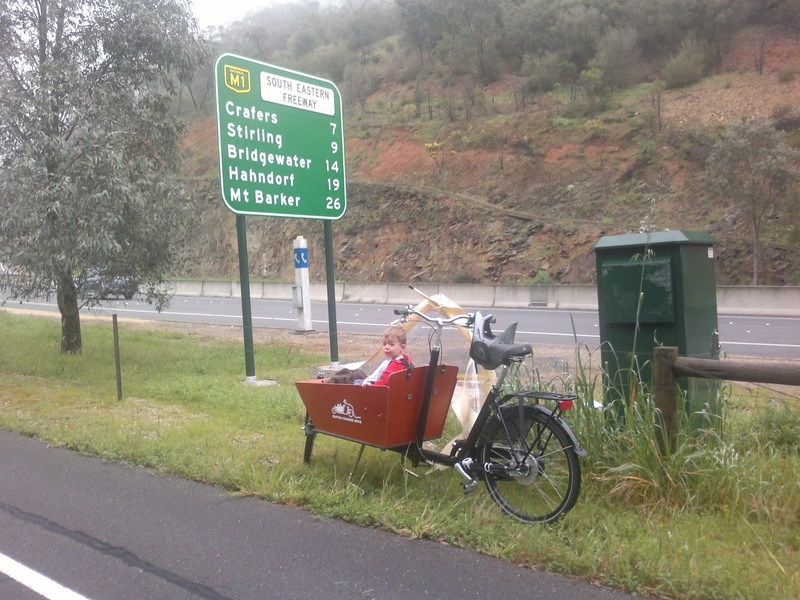 In the very least, I would like to be able to ride a loaded bakfiets from Marion to Mt.Barker so that I can ride myself to CE Camp each year, leave my wife with the car, and generally have fun with the bakfiets with a hundred high-school age kids. I hadn't planned today to be a bakfiets training day, but as it turned out I ended up riding for about five hours and covering about 70km, for an overall average of about 15km/hour, which I was pretty happy with. I think that this can be easily improved upon, which I will explain later in the post. My recollections of camping with a loaded mountain bike were of a similar overall average speed, so this is encouraging. This isn't too surprising, as the empty weight of the bike becomes less of an issue when you load it up. Also, the bakfiets probably has some advantages in terms of better handling than a mountain bike with a large bag occy-strapped to a rear-rack, which translates into an ability to maintain higher speed when corners are involved, etc. Anyway, my day today started out taking Mr.Grumpy-20-months-old out of the house to let Dione sleep. We set out at about 7:45am, and didn't need to be back until about 9:30am to get ready for church. I figured that it was probably enough time to make a shot for the Toll Gate at the bottom of the freeway. Route wise, I followed the Noarlunga line towards the city from Park Holme to Raglan Avenue, Raglan Avenue to South Road, then headed East up Edwards Avenue until Goodwood Road, and then North along Goodwood Road to Cross Road, and then straight up Cross Road to the Toll Gate. This route is a fairly steady and gentle climb until Edwards Avenue, where it slowly builds in grade until the last part of Cross Road which is quite steep. I should make an electronic inclinometer for the bakfiets so I can get a good feeling for which grades are comfortable and what angle is too steep to be feasible. Anyway, I was pretty happy to make the 11.6km or so in almost exactly an hour, given that it was overall substantially up hill, reaching an altitude of 167m, for an overall climb of about 150m. I found a mapping site that lets you draw where you went, and shows you the climb etc data for it. I mapped this trip here. When we got to the top, it was, as is usual for my morning rides, time for hot porridge, before turning around and getting home in just 35 minutes, the time differential indicating the difference that the grade makes when riding a bakfiets. Caleb eating his porridge while sitting in the box. The fog was sitting just above where we were. The second ride for the day was to church and back with Isabel -- only about 2km and one tricky railway maze each way. Fairly inconsequential in the grand scheme of things, but always fun. A few of our friends from church took the the time to oogle at the bakfiets, and one was even brave enough to give it a try in the church car park. The rest of todays ride was from our place to the Zoo and back, via different routes each way. To get there I followed Marion-Anzac-South and then the along the Torrens for a total of about 15km in almost exactly an hour -- about as fast as getting there by train from our place, once you factor in the walking at each end and waiting on the platform. Isabel pretends to ride the bakfiets while we unpack at the front door to the Zoo. You can just see that Caleb is in a backpack carrier, which I stowed in the bakfiets on the way there. It is so great to have plenty of space in the box. I was pretty happy with the speedy route to get to the Zoo, but riding along South Road is not the most pleasant, so on the way home I thought I would follow the Torrens further West, and then try to follow the Sturt River Linear Park back home. The Western end of the Sturt River track was not well signed, and I got lost a couple of times in the backstreets near Glenelg. Also, I ended up having to ride along Tapley's Hill Road on the Western side of the airport, complete with disappearing bike lanes at inopportune times, and lack of usable shoulder in the 80km/hour section. The end result was the route was much longer, and amazingly slow, taking about 1 hours 50 minutes to get home. The map is only approximate, as I did get lost a couple of times, and I am not actually quite sure of some of the parts near Glenelg, but it gives you the general idea. My claim of 70km today is based on my odometer, not the maps. The bottom end of the Torrens River Linear Park is very undulating with many short steep drops and climbs between river and road level, and not at all suited to a heavy bakfiets if you want to get somewhere reasonably quickly, or maintain a steady speed. Thus, even with a fairly fast ride at about 26km/hour along Tapley's Hill Road, the overall average was only about 13.6km/hour for that journey because of the many short, but slow climbs. With a more sensible route reflecting the overall flat journey, the average on the way home could have been more like 17km/hour or even better. While at the Zoo I happened to bump into an old friend who had lived in Cambridge for a couple of years and seen plenty of bakfiets and had been looking around at getting one here. The more the bakfiets in Adelaide, the better. I also spoke to a few families along the way to and from the Zoo about the bakfiets and how great a way to get around with kids it really is. This was in contrast to sitting up at the Toll Gate where bike traffic was mostly people on skinny bikes trying to get to Mt. Lofty in a hurry. It's just a different state of mind. So why did we get a bakfiets?